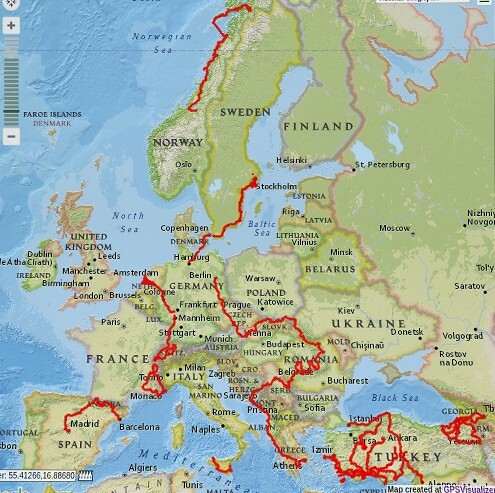 Kate and Eric cycled around the world in 1994-2000. I kind of wanted to continue on to Croatia and Slovenia and call it the Tour Around Hungary. We took a short break in Belgrade and ran to the warmer coastal areas where we spent the winter, arriving in Turkey Feb. 1, 2012. Snežana continued east, and I got stuck in Turkey. Here’s the route from Berlin to Çeşme. There was a boat in there from Athens to Çeşme via Chios. How great that none of these maps have scales. Realize that I didn’t really go very far. Although I still have a join me page, I’ve been more or less stuck in Antalya for about five years now. I even got married. So does that mean I can blame Ferda for not letting me leave? We do get out sometimes bicycling and traveling, and I’ve tried to keep the blog going. Also I’m still dumping my photos to flickr. Some other bicycle touring I’ve done includes Nova Scotia (Canada), many US tours (CA, NV, AZ, NM, UT, CO, WY, MA, NY, and VT), Vila Velha (ES) to Ouro Preto (Brazil), Honshu (Japan), Bangkok to Vientiane, Sulawesi, Kerala and Tamil Nadu (India), İstanbul to Cairo, and a 10-country tour from Addis Ababa to Cape Town. It’s taken a while after requests from many people, but I finally have a subscribe-via-e-mail link. It’s even been tested and apparently works. Look for a link on the right side of the page under subscribe. Should be pretty self-explanatory. November 2018 update: I know the RSS feed hasn’t been working for years, and I can’t figure out why. I’m guessing the subscribe-via-e-mail isn’t working either? found you through Zane’s blog. Glad to see it looks like a go. sharp photos. what are you using? I’m still using my first digital camera, a crappy old Nikon (Coolpics?) E4600 with a flaky on/off switch. I’m post-processing (with Shotwell), and I think that makes all the difference. By default the photos are washed out, but that’s easy to fix. Bryan…you look so happy. That says it all. How heartening to hear you made it to Berlin. Have been checking every day or so on your progress. So if the architecture is the second thing you noticed in South Beach, why only shots of buildings? Not much to report from the environs of Boulder except for squabbling everywhere about politics, the economy, Excel Energy. You picked a perfect time to travel, Bryan, and Jo and I miss you! Nice to meet you in Bratislava, best of luck with the trip! I made it to Prague eventually but thinking of heading home now, by bike or train, still not sure! I looked for Mateo (I’m sure that’s not the right spelling) on couchsurfing but couldn’t find him. What’s his username? Bryan… I need a “MapMyRide” map of your route. Being a GIS nerd I need to see a map. Wishing you the best and smooth roads ahead. Bryan! Hello from the mews. So happy for you (always). I love getting your posts especially at work. Brightens my day and reminds me to get out more! Hvala, Ivan. Vidimo se nedelja! Hi Byran, looks like you’re having a great ride! Great photos too. It looks like you are having a fabulous time. Great photos and narrative! Your shelves are doing fine, and we are taking good care of them. I was telling a cycling buddy of mine, Jim, about your website and thought I had better check it out and say hi. Great to hear from you! 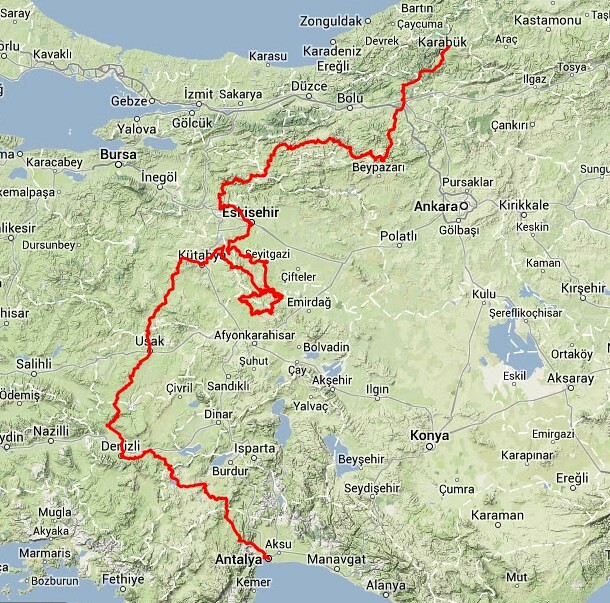 When you are coming to Turkey for a little cycle touring? Haha, the shelves!!?? I wonder how much of my stuff that I scattered over Boulder hasn’t been sold on ebay yet! I just met your sister Megan here in San Miguel de Allende. She told me about your trip. I’m also a computer guy who is travelling the world, mostly visiting UNESCO World Heritage sites and other stuff in between. I just began… been on the road for only 5 months now. I’m currently reading your posts about Mexico. My next stops are Querétaro, Morelia and Mexico City. Looks like you have lots of fun. Are you still based in Antalya? My boyfriend and I would like to follow in your footsteps last spring (2013) and climb Tunc Dagi when we visit. We will be in Antalya from 1-3 May. Are you up for a climb, or can recommend someone who knows the area and the route? Do you know what conditions will be like in a month or so? The Koenigs and the Helmigs are coming to the Greece Island of Ikaria in June. Would love to meet up if you are in the area. I met your folks and Megan at a conference over the past few days. Classic. Such amazing people! 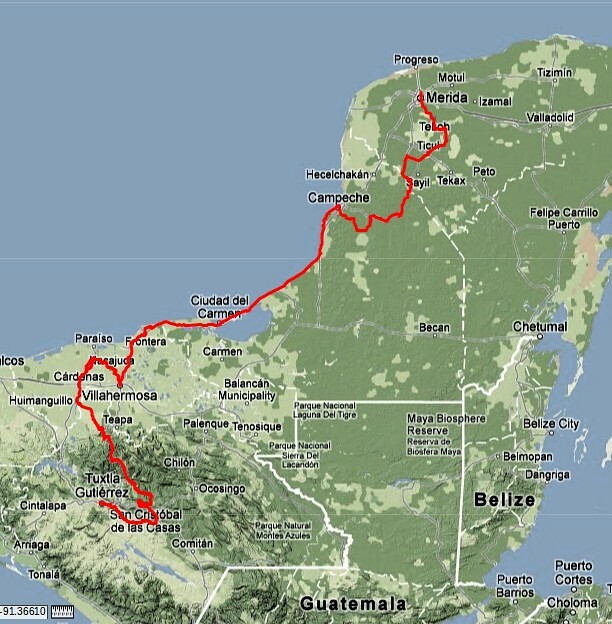 It was great hear about another cycle-touring person. what an awesome experience! I left South Africa in 1996 to kayak down the Yukon river system for a year, but detoured to the Rocky Mountains and ended up cycling the Rockies from South to North (in a weird zig-zag unplanned way) & then down the west coast (USA & Canada) for 9 months. I did some of Europe in ’94.